After preparing the infrastructure, you're ready to install and configure the SCAP extensions for Configuration Manager on the computer from which you want to run this process. Copy ConfigMgrExtensionsforSCAP.msi to the computer with the Configuration Manager console where you want to run this process. In Windows Explorer, go to the folder where you copied ConfigMgrExtensionsforSCAP.msi. Double-click the file to open it and start the SCAP extensions for Configuration Manager installation wizard. Review the license agreement. Click I accept the terms in the License Agreement and then click Install. When the installation is complete, click Finish to close the installation wizard. The installation wizard installs the SCAP extensions in the Configuration Manager console install folder. By default the console install folder is C:\Program Files (x86)\Microsoft Configuration Manager\AdminConsole. Before you can run the SCAP extensions, you must download the SCAP data stream files from the National Vulnerability Database (NVD) download page. Then copy them into the folder where you installed the SCAP extensions. Depending on your environment, you may not need all the SCAP data stream files listed on the download page. Visit the NVD Web site to identify the SCAP data streams that are required by your organization. The SCAP data streams published by NIST are organized into multiple bundles, which are also called checklists. Download the SCAP data streams from the NVD Web site, which are stored in compressed files with a .zip file name extension or marked as DataStream XML file. There are many SCAP data stream files with the .xml extension that you can download from the NVD. However, only .xml files that include XCCDF (SCAP1.0 and 1.1)/DataStream (SCAP1.2) content are appropriate for use with the SCAP extensions. Extract the SCAP data streams .zip files/DataStream XML file that you downloaded into the same folder where you installed the SCAP extensions. After getting the SCAP data streams, you're ready to import and convert the data streams to configuration baselines. The SCAP data streams published by NIST are organized into multiple bundles. Follow NIST's instructions to verify which bundles to use in your environment. For example, there's a separate bundle for each version of Windows, another version-specific bundle for the firewall configuration, and a bundle for Internet Explorer. Use the following procedures to accomplish this task. This section describes the manual process to convert and import the data stream files with the Configuration Manager console. To automate this process, see the next section to Automatically convert and import the SCAP data stream files. 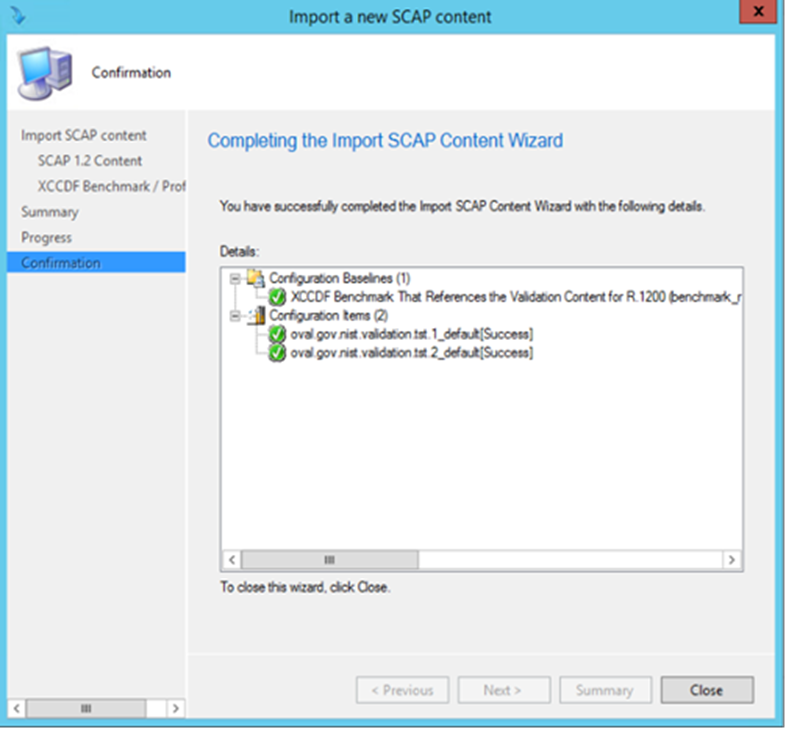 Click Import SCAP Content wizard in the ribbon from the configuration baseline group. Select the SCAP content option. 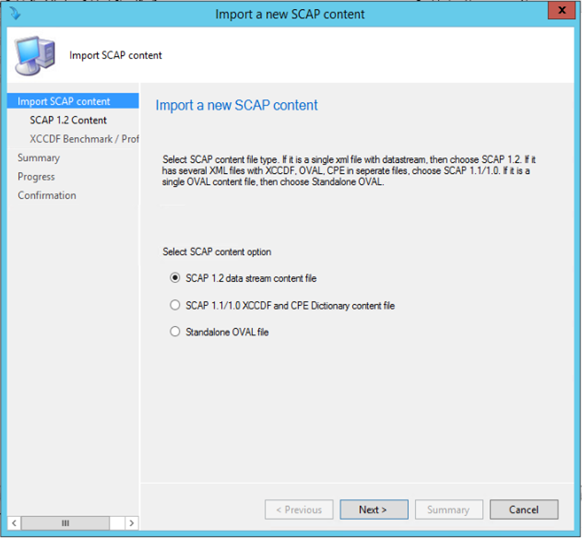 Select the SCAP data stream file, XCCDF, and CPE dictionary file or Oval content file. 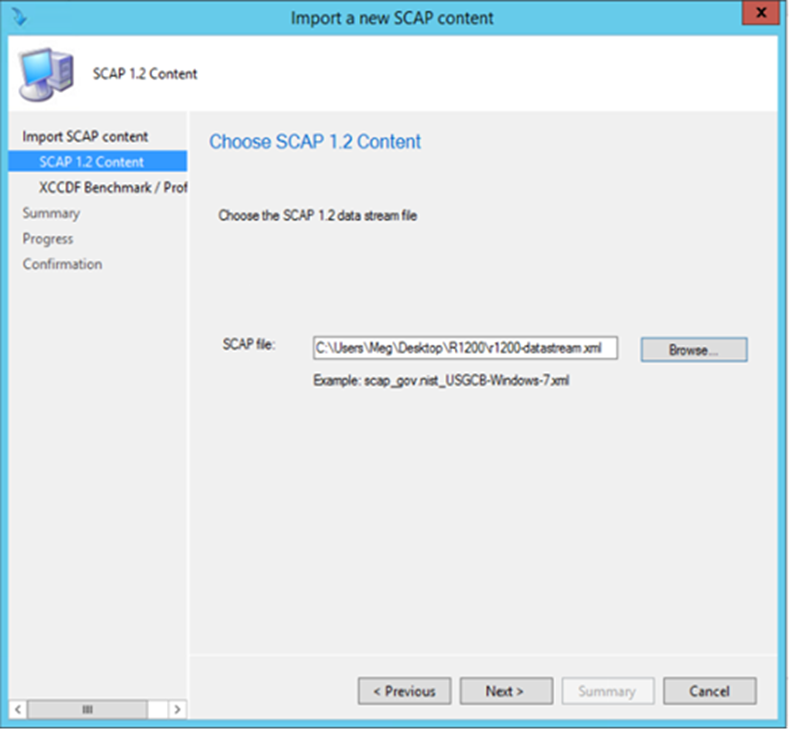 If SCAP 1.2 select the data stream. 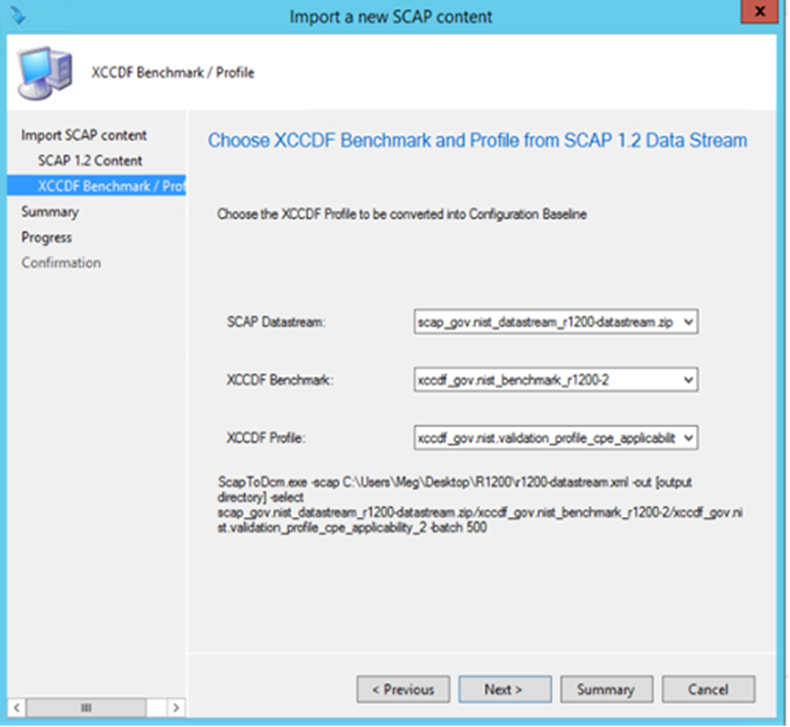 Then select the benchmark and profile for SCAP 1.x. Click Next to convert the content. This page of the wizard displays the command line you would use with the ScapToDcm.exe tool to automate the same process. Confirm the configuration data to be imported. Click Next to import the configuration data. 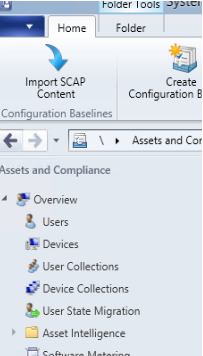 After getting the SCAP data streams, you can use the Microsoft.Sces.ScapToDcm.exe tool to convert the SCAP data streams into compliance settings-compliant .cab files. Then import the .cab files into Configuration Manager. 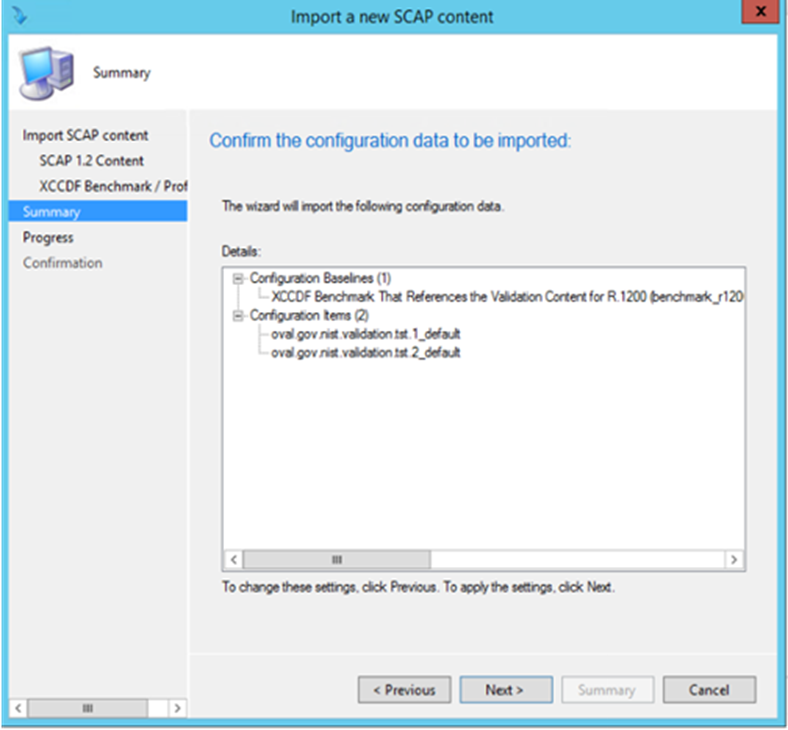 The Microsoft.Sces.ScapToDcm.exe tool converts the SCAP data streams into configuration items and configuration baselines that you can use in Configuration Manager. The Microsoft.Sces.ScapToDcm.exe tool converts the SCAP data streams into XML manifests. It then packages the XML manifests into a .cab file that you can import into Configuration Manager. Step 4 of the manual process in the previous section shows the page of the wizard that displays the command line you would use with the ScapToDcm.exe tool to automate the same process. At the command prompt, go to AdminConsole\Bin folder, and run Microsoft.Sces.ScapToDcm.exe. This tool generates a compliance settings-compliant .cab file, and imports it to the Configuration Manager site. Your account must have read/write permissions for the output folder. If you don't specify the benchmark/profile by using the –select parameter, then the tool generates a .cab file for each benchmark in the content file. If you don't specify the datastream/benchmark/profile by using the –select parameter, then the tool generates a .cab file for each benchmark in the content file. If there are multiple values for one variable in the external variable file, then the Microsoft.Sces.ScapToDcm.exe tool treats the values as an array for this variable. The next step in the process is to use the Configuration Manager console to import the compliance settings-compliant .cab files into Configuration Manager. When you import the .cab files you created earlier in this process, one or more configuration items and configuration baselines are created in the Configuration Manager database. Later in the process you can deploy the configuration baselines to device collections. For more information, see Import configuration data. The location of the .cab file that you previously created is the folder specified by the –output parameter of the Microsoft.Sces.ScapToDcm.exe tool. Repeat this process for each .cab file that you created earlier in the process. There's a .cab file for each selected profile in the XCCDF/DataStreamXML file that you downloaded from the NVD web site. You can process these files by running the Microsoft.Sces.ScapToDcm.exe tool. The imported configuration baseline is read-only, its status is Enabled, and its deployed state No. The Date Modified property shows the time that you imported the baseline. The name of the configuration baseline comes from the display name section of the XCCDF/Datastream XML. The name is constructed using the convention ABC[XYZ], where ABC is the XCCDF Benchmark ID, and XYZ is the XCCDF Profile ID (if a profile is selected).